When we first de-pink, we are dealing with the anger, and shame and humiliation (in some cases) of what we did, how stupid we were, what we believed and perpetuated in MK. Many on Pink Truth have reported it has taken quite a long time to fully purge themselves of these feelings because so much has been denied or stuffed down, that when it surfaces, the whole process starts over. It’s the “stages of grief” times ten. When it was first revealed to me (here on PT, of course) that in fact, no such observation by scientists exists concerning the bumble bee, I thought, well that just fits! Another lie. Another emotional plea to give me the “feel good” goosebumps. 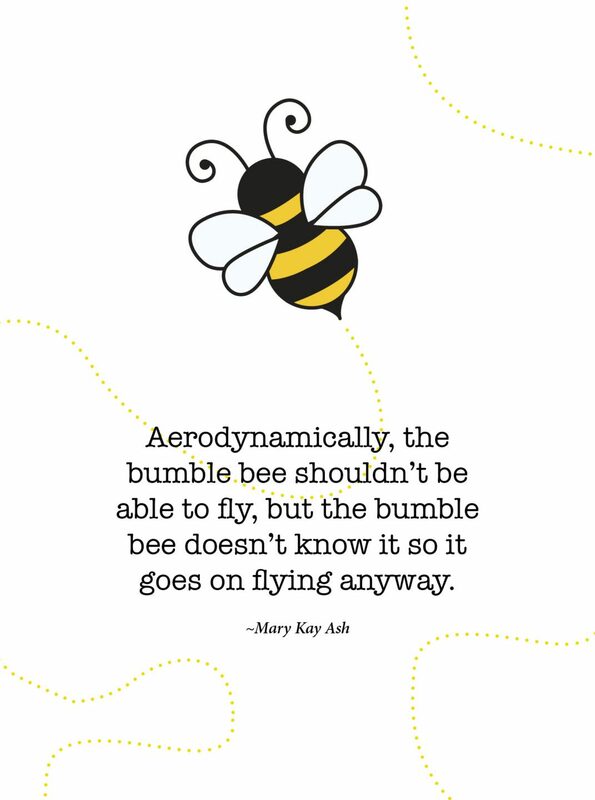 Another Mary Kayism whose intention is to keep you on the path, defying what you see all around you, believing in the impossible potential of being too laden down with weight and inability, who somehow supernaturally “lifts off” on sheer encouragement. When the anger of yet another “con” passed… it occurred to me that yes, in fact, the World of the Bee is very much the symbol of Mary Kay. The Bumblebee can fly because the beating of its wings creates a very powerful vortex (think swirling tornado) of wind above its wing in each oscillation. Its called “dynamic stall”. All this crazy activity produces many times the lift of just a normal aerofoil in flight. Get the picture? Think treading water with your arms and kicking your legs. The bumblebee colony is a very social one and has a Queen Bee too. The workers are the daughters of the Queen Bee. The drones are males. That fits. Bumble Bees survive only during the warm season. When things get cold, the Queen hibernates alone to begin another colony in the spring… around Career Conference. Did you know that few bees can control their body temperature, but the Bumble can. She can be Hot! Hot! Hot! whenever she wants. Queens and workers shiver their flight muscles to warm themselves. “If it is to be warm, it’s up to the swarm!” Queens construct “cells” for her egg daughters, covering them with a kind of waxy paste. The larvae consumes this paste to grow, and then later they are fed through a small opening in the cell wall. Kind of gives me the picture of no garbage in no garbage out. Very limited input. The daughters get only what the queen feeds them. The daughters spin a cocoon, metamorphose and emerge as the colony’s first workers. (Called a first line). Subsequent larvae are reared by these workers. That’s the second line. Did you know that colonies have 50 to 200 bees at peak population, which occurs in mid to late Summer… just in time for Seminar? As the seasons change and the weather turns cold, the colony suffers terminations and the queen flies off to replace all those workers, in a “no, next” sort of fashion. She can not prevent the inevitable. She must find a new location, build a nest, paste the egg-workers in and feed them only what she wants in order to produce new “daughters” who will do it over and over and over again. Flying around in tornado-ish “PPA’s” (pollen producing activities) they bring new fuel to the hive to keep Miss Queen alive. However few daughter bees survive the cooling off period, and the few who do will offspring to begin their own colony- start their own nest. At the same time, all this activity produced honey. The bees use some of it themselves, but most of it was captured by a corporation who processes the honey and makes money off the Hive. As long as the corporation doesn’t disturb the bees, all the PPA’s continue. Disturbed queens will sting you. Bumble bees have stingers without barbs on them, so they can sting you over and over and over. And so it is with the Bee Story. A pretty near exact representation of life in a Mary Kay colony. The Bee story makes perfect sense because a whirling tornado creating a vortex is exactly how you have to work the business if you want to stay above ground. You will beat your wings in an attempt to fly, metamorphosed by the waxy paste of your NSD’s and Corporates programming, only to find yourself hunting for pollen as the flowers dry up and the leaves fly. Your NSD Queen escapes. But maybe this time, so can you. Whoa, I love this, yes, brilliant. You are actually incorrect. Any Google search will tell you that a French entomologist questioned the ability of flight in bumble bees in the early 1900’s. Oh, you mean the guy who *thought* bumblebees shouldn’t be able to fly but was completely wrong about that? That’s right. Science debunked his idea. Yes dear, I said that he “questioned” it. Not that it was PROVEN. In the OP, the author states that no such observation exists. When, in fact, it does. Where did they go wrong? Sainte-Lague used the simple equations for calculating wing lift for ordinary airplanes – with the usual rigid wings. When was the last time you saw a 747, or even a Piper Cub, flap its wings? 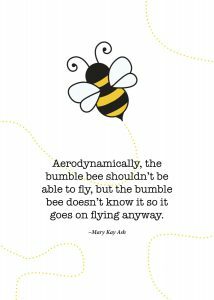 There is still truth in the statement that ‘aerodynamically, the bee looks like it shouldn’t be able to fly’. A popular misconception,maybe. However, this is not a lie. I’m simply stating to the author of this post, that it’s not an outright lie. Maybe, except for the fact that God whispered into the ear of the bee. 🙄🙄 If that part of the fable didn’t make you think this was just an inspirational myth, then idk what to tell you. All those bee pins paid for with thousands in debt and families ruined. That’s the tragedy of this nightmare fable.